If a bomb explodes, kills people, and no one is around to report it—would we all still feel ‘terrorized’? Think about it for a second. If we weren’t constantly bombarded by over the top, sensationalized news reports, or heat of the moment posts on social media, would the world be such a terror-able place? In case you haven’t heard, the world is now a scary place. People can’t do innocent things like run marathons, catch a movie, or even go to school, without fearing a massacre. It’s happened before, it could happen again, we tell ourselves. 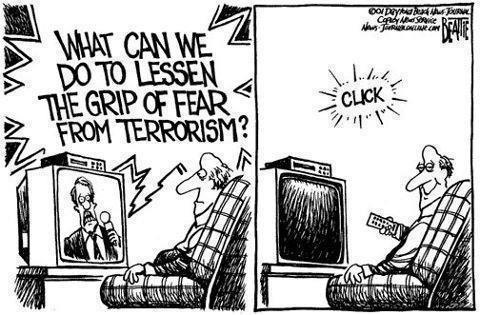 Fearing that something bad could happen at any time feeds the terror, which then feeds the media, which causes more fear, and so on. Cause and effect situation in full swing. In the past we had to wait while the media gathered initial facts to report. Now, when an event happens, social media erupts right away with live, unfiltered posts from the public. News agencies swoop in, try to confirm Tweets while gathering “experts” to speak on behalf of the situation. First come alarming headlines like Terror Alert or Terror in Progress. Then comes info on the victims or from witness accounts—crediting social media. When ‘terrorized’, we empathize with the victims, or their families and friends. We wonder what it would be like to be in their shoes and experience such a tragedy. Then we think about what it would be like to in our own shoes and have that happen to us. What about my home? What about me? After the Boston bombing, news reports way over here in Vancouver began questioning the safety of the upcoming Sun Run. Will the runners be safe? What’s the VPD doing to ensure a repeat event doesn’t happen here? How can Sun Runners protect themselves on Sunday? All valid questions, but seriously? One bombing happens at a run, so that means someone’s targeting all runs? It’s the terror talking, calm down people. Sometimes an event doesn’t even have to occur. The thought of it is enough. Right now, headlines in Canada are going crazy about a “Terror Plot: Foiled”. Assistant RCMP Commissioner James Malizia reports ‘“Had this plot been carried out, it would have resulted in innocent people being killed or seriously injured”. Well, duh. In this case no one was hurt, no one will get hurt, and business can continue as usual for everyone. But this plot could have happened! Next time, we might not be so lucky! … There’s the fear. There’s the terror. Funny thing about fear. It makes us all do crazy things. Living in fear can lead to hasty decisions. After a horrific event, we play into the fear, becoming more willing to do what it takes to prevent a repeat performance. We forget about things like privacy. Not surprising, talks of increasing street surveillance have popped up in the news. If there was a better grid online, it would make tracking terrorists easier. That’s what you want, right? How does one fight a war against terror? More violence? Less personal control for the sake of the ‘greater good’? Sounds to me like if it’s ‘our freedom’ that’s under attack by terror, the last thing we should be doing is sacrificing more of it to defend it. Is the world actually a scary place to live? Or are we just making it sound that way?